Home / Electrical / What is Synchronous Motors how it different from Induction Motor ? 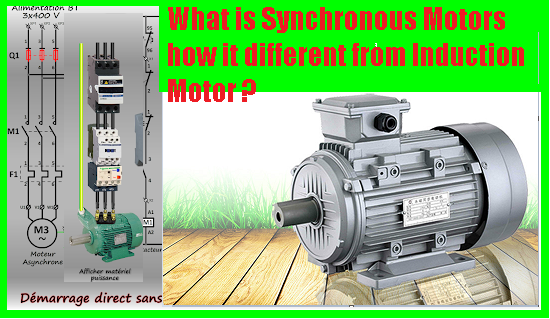 What is Synchronous Motors how it different from Induction Motor ? As we already described there are two types of motors available in the electrical industry which depend on the type of supply. When the motor is run using the Alternating current It normally says as AC motors and for direct current, it says DC motors. AC motors can also classify as synchronous motors and asynchronous motors. Normally Induction motors are famously known as asynchronous motor and we have already discussed several articles regarding the induction motors in our previous articles. The construction of the synchronous motors are different with an induction motor and this synchronous motors got a specific number of a pole which mounted to rotor winding. P means the number of poles of the synchronous motor. When one motor has two poles and another motor got 14 poles the 14 poles motor will run at precisely 1/7 of the speed of two pole machine. If we consider about the rotor of the synchronous motors there are two types of the rotor and both of them are fall underwound rotor category. However, the salient pole is too weak mechanically and te develops too much winding resistance and the noise. When the synchronous machine is used as generator salient pole rotor type generators (alternators) are used in hydropower stations. Cylindrical rotor generators are used in the stream on the gas turbine power stations due to the speed of the rotation. In a single phase motor the instantaneous power pulsating at twice the supply frequency consequently. there is torque which pulsating at the double the stator frequency. The pulsating torque is present in additional to T-S charismatic ( The time average torque ). There is a maximum possible torque that cannot be exceeded. This type of torque is known as pull-out torque as breakdown torque. Normally this torque is two to three times larger than the rated full load torque of the induction motor. Normally the load torque should be less than the starting torque of the induction motor to start the motor which consists a load. When a motor reaches the stable state, it develops a torque which is equal to the load torque and this torque is referred as point “0”. When the motor is running under stable, the load is reduced and the rotor speed will increase, so the slip will reduce due to the induced voltage and the current in the rotor will reduce as result. Due to the above phenomena, the developed torque reduced and also equalized the reduced torque. When the motor is running stable condition and if the load has increased the rotor will slow down. So slip increases, the induced voltage, and current increases, as a result, the developed torque increases and equalized the increased load torque. The pulsating torque results from the interaction of the opposite rotating field across each other twice the synchronous speed. It also produces a humming effect and also makes a single phase motor noise than the polyphase motor.The effect of pulsation torque also can be minimized by using elastic mounting rubber pad etc. Unlike induction motors, synchronous motor needs an additional Direct current power supply to energize the rotor winding because the synchronous motors are not self-starting. Since the induction motors always run under the lagging power factor the synchronous motor can runs leading or lagging power factor. The main reason where synchronous motors used in the industry is due to its efficiency. Normally synchronous motor contains better efficiency than the induction motor but the cost is also high.